Life Music Laughter: Disney's Tomorrowland is a Plea to Put Aside Apathy and Remember the Future. Remember when the future was full of wonder? When we thought cars would fly, food would appear at the touch of a button, and we would travel to outerspace on vacation? It was a simpler time where we could dream of all the wonderful things our future would hold for us. We wanted to make the world a better place through art and innovation, and through giving to others to better their lives. Somewhere along the way we got caught up in our own lives and stopped thinking about the wonderful possibilities of the land of tomorrow, and started focusing instead on amplifying all that is wrong in the here and now. 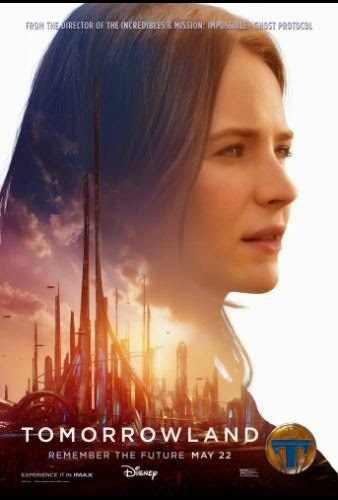 This is the story that Disney's Tomorrowland illustrates for us. It opens at the World Fair of 1964 with a young boy full of imagination and invention that is given a special pin by a young girl that will take him to Tomorrowland. Flash forward to modern times and we find a girl that is doing everything she can to stop the destruction of the NASA launching pad to keep the dream of space exploration alive. She too, receives a pin, and sets out to find Tomorrowland. To do this she must find the young boy from 1964 that is now a jaded adult who no longer has hope for our future. Together they work to save Tomorrowland, and the future of our world. Tomorrowland is not just a fun sci-fi film that entertains. It is a thought provoking observation on what our world has become and a reminder that if we don't take action to create peace, preserve our resources, and continue to dream and innovate, we will not have a tomorrow. What we do (or don't do) today impacts the world that we leave for our children and theirs. While that may be a rather bleak message of doom and gloom, it is paired with a nice reminder that it is never too late if only we have the courage to act. Disney has created a movie that can help to start conversations with your children about the difference they can make in the world. I'm sure it will inspire future scientists, mathematicians and artists, and most importantly...dreamers. See Tomorrowland, and remember the future. Disclosure: I attended a free screening of this movie in order to cplete the review. I was not compensated. All opinions expressed are my own.